An almost incalculable number of crimes against humanity are the legacy left by Josip Broz Tito, the leader of former totalitarian regime of communist Yugoslavia and yet the sculpture of him in the form of a bust has managed to remain in the main foyer of the Office of the President of Croatia all this time since Croatia succeeded to break away from Yugoslavia, becoming an independent and democratic country, now a member of the EU. If we take the transitive verb “bust” as meaning “unusable” then, indeed, the bust sculpture of Tito in the top office of this democratic country simply can no longer be tolerated, nor is it appropriate since Tito’s track-record in planning and encouraging the perpetration of incalculable crimes against innocent people had actually rendered the presence of his bust unusable and inoperable in a system of freedom and democracy and self-determination. The communists and former communists of Yugoslavia/Croatia have insisted on having Tito’s bust displayed in that prominent place, as is the office of Croatia’s President – arguing that Tito and his WWII endeavours represent the very notion of antifascism upon which independent Croatia was created and built. However, the very truth of the matter is that modern Croatia was created by an overwhelming number of people who rejected communist Yugoslavia as created and maintained by Josip Broz Tito and his followers. Praiseworthy – one of the first moves made by the new president of Croatia, Kolinda Grabar-Kitarovic, as she stepped into her role of president was to announce the removal of the bust of Tito from the Office of the President. In this move, Grabar-Kitarovic emphasised that she continues to hold antifascism as an important foundation of Croatian independence and democracy but that Tito was a dictator and, therefore, a sculpture of his image has no place being there. The first president of Croatia, Franjo Tudjman, considered Tito as one the great statesmen in post WWII Europe, however, he also emphasised that Tito was responsible for the widespread communist crimes committed against innocent people under his leadership. Certainly, the true antifascism many Croats say they subscribe to cannot be associated with Tito’s communism even though this is exactly what they’ve been trying to do and trying to protect ever since Croatia broke away from the former communist Yugoslavia in the early 1990’s. Indeed, by insisting on communism as being equal to antifascism – the last two presidents of Croatia (Stjepan Mesic and Ivo Josipovic) have managed to make Croatia a painfully backward and divisively active country when it comes to facing the ugly truth of Tito’s (Yugoslav) communist totalitarianism. They continue misusing and abusing the term “antifascism” by pinning it to Tito’s communists. 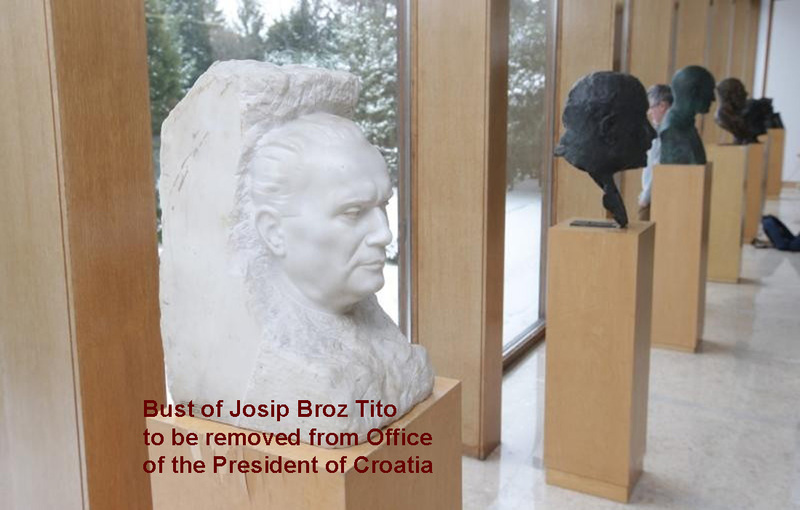 EU’s condemnation of totalitarian regimes and their crimes simply does not go with having Tito’s bust displayed in the Office of the President of one of its member countries. Furthermore, one must conclude that breaking away from communist Yugoslavia also means placing into history, and not keeping alive in the Office of the President, the symbols of communist Yugoslavia, which is a bust of Tito. But of course, not a word from Stjepan Mesic about the communist crimes perpetrated during his “brightest pages” of Croatian history! This obnoxious political scourge Croatia has been burdened with surely must end. One cannot tolerate accusations of profascism and neofascism, where there are none, even if they are, as in the case of Stjepan Mesic – desperate and last ditch efforts to save Tito and communism from the gallows they deserve. If these are not justified grounds to do away with the office of former president Stjepan Mesic by the same standards as for Ivo Josipovic – i.e. five years after the presidential mandate end, then I do not know what are. Croatia simply cannot tolerate the incessant vilification of its people who were not communists during the life of former Yugoslavia! The only way unity, to which president Kolinda Grabar-Kitarovic fervently aspires, can be achieved is through the truth. It will take the strength of Croatia’s new president – Kolinda Grabar-Kitarovic – to separate true antifascism from Tito’s/communist Yugoslavia antifascism. True antifascism cannot and must not be associated with communist crimes of WWII and post-WWII. So, thumbs up to you and your courage – president Kolinda Grabar-Kitarovic! About bloody time! Cant believe it took so long! About F*CK*NG TIME !!! The bust of the genocidal locksmith should of been discarded to the trash bins of history a long time ago. The other months I was talking with a friend: her parent’s got out of Yugoslavia-Serbia-Croatia we was talking of the killing occurred there of Italian’s-Croatian and she said her parent’s father Serb-mother Italian can stay there with all the hate and crime and the Tito regime. No country is perfect nearly all had done some bad thing but Tito, Stalin had much in common with Hitler: using genocide to impose they will and ideology. His Bust should be put in the toilet facilities. My love & respect for this woman grows with each post! So in just a few days Kolinda has done more good than YUsipovic and The Bearded Yugoslav Maniac didn’t do in 15 years. A great start for Kolinda and I am sure many more to come. For once a politican with conviction to do what was promised. CIA report says that “Josip Broz Tito” spoke the “serbo-croat” language with a Polish or Russian accent!…so if he was a Croat, that is OK, but since he couldn’t even speak the language, why even honor him? My neighbor was in Trieste in 1953 during the Trieste Crisis, when Winston Churchill (for whom some say was a war criminal too) said that….”an iron curtain was descending on Europe”, and Tito was making a speech. He said that he couldn’t even speak the Croatian language well except under extreme stress! But then he couldn’t speak ANY language of the former-Yugoslavia well! So, why would Mesic et al. even bother with this NON-Yugoslav? Yes, the removal of Tito’s bust from the office of the Presidency is now, all of a sudden, a newsworthy, hugely publicized topic. It is being touted as an indicator that our newly inaugurated president – Ms. Grabar-Kitarovic is preparing to set herself apart from her predecessors; Tudjman, Mesic and Josipovic (who each for their own reasons chose to keep the bust in their offices) – and I wholeheartedly hope that she will endeavour to distance herself from them and their ilk. I would just like to note that as much as this is being promoted as a positive sign for Croatia today, conversely, would it not be correct to say that by not taking a similar stand in his Presidency, Mr. Tudjman sent a regressive, negative message to the world? Why was he unable to decisively, clearly and unequivocally distance himself from his “antifascist” past? Why could he never separate himself and his govt. from the communists of the former regime? Why did he never institute a form of truth and reconciliation committee to address the wrongdoings and wrongdoers of the past? 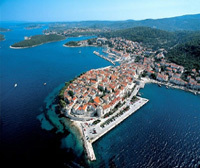 Modern Croatia was being reborn, Croatians gave him and his govt. a clear mandate to break away from the oppressive communist regime and to set Croatia on a new path and he failed them. Isn’t it interesting that a thing such as this is packed with such significance and meaning? And it is only one such example out of hundreds, perhaps thousands to be found throughout Croatia. Each street sign, each town/village square, each monument, each building bearing the name or likeness of our antifascist heroes should be expunged from our physical surroundings and thereby, eventually from our national consciousness. Perhaps Tudjman assessed at the time, Velebit, that given the international forces from which he sought recognition of the independent Croatia related more positively to symbols of antifascism – Tudjman in my opinion made a mistake for not separating antifascism from Tito – but hey, it was war time and time for survival battles so perhaps the time swallowed up what should have been done, what was planned to be done? I agree Ina. We need to look at the context of the time and the external factors – namely, Greater Serbian and Western propaganda framing Tudman as “the new Pavelic,” the bust being a very clever, total inversion of that conspiracy theory. As for Tudman, well, he had his flaws but he achieved every single wartime objective laid out in 1991 – he was a wartime president (remember Milosevic was still in power through the end of his presidency and life). His funeral speaks of what the Croatian people thought of him: https://www.youtube.com/watch?v=U6hTbLJszyM. Sorry, wrong video. Funeral: https://www.youtube.com/watch?v=iB4qvZZRtYc&list=PLFC113C7EC1881D6A. I think that the fact that a decade and a half after his death greater Serbian nationalists, Yugoslav nationalist socialists, sham NGOs and guilt equating Yugonostalgic Mercedes Marxist Western Academics remain obsessed with painting Tudman in a negative light demonstrates just how successful of a leader he really was. Everything else is pointless debates about nuance. That is you opinion, Stipe, and you’re welcome to it but it is not the one based on the truth. People fled communist Croatia for fear of their lives, and most lost it anyway – through Tito’s orders and politics. There was no cowardice in trying to save your life faced with blood-thirsty communists. Do not forget even Stalin ceased to be called a fascist by the “West” once Hitler became the enemy. Please do not take side on crime – crime is crime – no excuses no justification. Stipe, you are totally wrong. Most fled Yugoslavia because they did not want to live under communism and not because they were involved in subversive actions. What rubbish. Yugoslavia under Tito lived “well” because Tito borrowed money and by mid-1970’s 94% of companies depended on bank loans to pay wages – I know that first hand. Tito fooled the West making them think he is against Stalin and the Soviet communism etc when in fact he wasn’t and he certainly did not align with the West apart from inviting movie stars and politicians to Brioni – he was one of the founders of Non Aligned Movement which was his excuse for not aligning fully with the West bar getting funds out of it. There are a lot of people who hate Tito because of his crimes and rightly so – the man was a criminal and a cheat. Wow Stipe. You need to read something besides Borba. Tito’s war crimes are well-documented and for you to suggest that killing women, children, the elderly, and unarmed men in Bleiburg and in the Death Marches as a “settling of scores” is pathetic and warped. What crimes did children commit? If anyone is accused of war crimes they should be tried in a court of law. Would love to hear about the ‘good’ Tito did during WW2 and especially after it……hmmm setting up camps like Goli Otok and Stara Gradiska? Jailing political dissension? Having his cronies murder the Catholic clergy? Dumping Blessed Stepinac in prison and poisoning him? Everything that came out of so-called AVNOJ’s and the UDBA kitchen was from the megalomaniac, blood-thirsty dictator Tito. Tito as a so-called ‘ww2 allied war hero’ is based on sheer myth and propaganda. It’s easy to create your own version of the war and what allegedly happened and so-called history when you’ve slaughtered your opponents. Tito learned well from the Soviets and slaughters like the Katyn Forest massacres. You seriously need to read more because your comments are embarrassing and utterly ignorant. 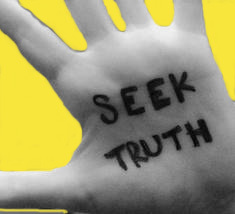 The truth shall prevail, like it has with Blessed Stepinac. “Stipe” seems to forget the 1918-1939 monarhofascist dictatorship (and the fact that in ’41 Belgrade was looking to undo the 1939 Sporazum), the Chetniks, Serbian Gendarms and VJ massacre / scorched earth policy while retreating from the Germans without firing a shot, and the Communists’ wartime slaughtering of civilians – not to mention the post-war slaughters – that ‘Yugoslav’ “historiography” left out of the phony, falsified fantasy narrative they spewed and indoctrinated people with. Ironically we the Non-Serbs were murdered by the same army we build up with our own tax money we were killed with our own paid bullets and bombs. How could the Yugoslav army attack with full force cities full of babies and grandmothers just for the sake of killing them… was the whole brotherhood and unity talk a lie ? this week the bodies of 8 croat children was found outside Banja Luka killed by the same army that said it will protect the people of Yugoslavia. Can I get a picture of you when you were 25? quanto hai ragione! purtroppo anche i più orrendi crimini perpetrati contro l’umanità sembra non abbiano insegnato molto agli attuali dittatori. Google translation of comment by ventisqueras: how right you are! Unfortunately, even the most horrendous crimes against humanity seems to have learned a lot from the current dictators. I thank you for the honor you do me interessandoti to my post passes a happy day, dear. I’m Croatian.. this is a load of Right wing rubbish; you can’t claim anti fascist history in Croatia without Tito. Nothing Right wing about Titos mass murders and communist crimes, Ana – true anti-fascism has no such pursuits. Tito’s followers do like to hide behind the tag of anti-fascism but there is a huge difference between them and true anti-fascists especially after 1945 all the way to 1980’s. DELETED AS OFFENSIVE … where many people fought with Tito’s partisans against the Ustasha’s fascism, and a significant sector of the population have a strong anti-fascist tradition. Under Pavelic’s Ustasha regime during World War II, hundreds of thousands of Serbs, as well as anti-fascist Croats , Jewish and Roma civilians, were imprisoned and murdered in Croatian death camps. Tito (the greatest Croatian) was a Social Democrat who fought against fascism in all its shapes and forms – fighting Nazi Germany and Mussolini’s branch of Chetnik troops (supported by the British) in the heart of Europe. After 1945 Tito was relatively mild towards dissidents and nationalists. He either put them into prison for several years or removed them from the political scene when they were seen to be a danger to his undisputed popularity or publicly defied his official communist party policy. I am against political persecution, but when you look back, you can see that those people led to the evil that happened after Tito’s death. I’m not Yugo-nostalgic (not at all!) but compared to what we have now, Tito’s era was the time when God walked the earth. My parents (who have never been members of the Communist Party) look back on that time very fondly. They both think Tito’s socialism was more human in sense of solidarity, economic security, and more rewarding way of life. It was nothing like the USSR. You were allowed to travel freely in and out of the country, you could own a small business and own your own land. Thinking back, all my neighbors had jobs with a decent income, they had houses or apartments, they went on holidays every year and life was generally good. You didn’t grow up in Tito’s Yugoslavia so I wonder what makes you think you are an expert in the field? ‘Thanks’ to people like you, Croatia is profoundly politically divided country today. Tito died a LONG time ago. Now it’s time to think about the future! Actually Ana I did grow up in Tito’s Yugoslavia to my teens and then lived there again in the seventies so I think I do have some first hand experience and also I rely on facts – if you call being among 10 greatest mass murderers of 20th century as Tito has been listed – by British sources actually – then there’s nothing mild about him – we’re talking of mass murders of almost 800 mass graves discovered so far in Croatia that were started in 1945 onwards, if you talk of hard labour and torture prisons started and maintained by Tito etc You are welcome to your opinion but the reality is that those years were better all over the world and Tito maintained much of the industry on foreign loans, a false economy, jobs for life regardless of productivity levels etc…No one is denying the WWII crimes occurred in Croatia under the so-called Ustashe regime but it’s time we also look at crimes committed under Tito’s regime and these crimes have been hidden by that regime, of course. There is no justification for murder of innocent people no matter who commits them, you just seem to live in denial of communist crimes and you’re welcome to do so I, for one, would like to see all crimes committed come to justice for victims. Communist DOES NOT equal anti-fascist, don’t forget that even if former Yugoslavia communists label themselves as such – they were fascists under a different label as far as I am concerned and I am not alone. I would love to see your sources for these “genocides” you speak of. I am doing a paper in English in which I have to do research on Tito and so far from all of my sources I have nothing to suggest a genocide in Yugoslavia when Tito was in control (WWII Chetniks mostly did it and then the Serbs again in the 90s-00s). I have a wide range of sources from Schools, papers, articles, etc. and not once have I encountered anything of genocide (with the exception of a few dozen killings of political desenters who were of all of the Yugoslavic ethnicities). Please send me your sources. I also have Croatian friends who sa that Titoist Yugoslavia was the greatest time ever and Serbian friends who hated Tito because he supported “non-Serb interests” within Yugoslavia. Once again please send me your sources. Oh Irish17715 just search for genocide in the name of the state, search for communist crimes in Yugoslavia and you will have your sources. Titoist times were not the greatest because Tito kept Yugoslavia going on borrowed money and when the money sources dried up came inflation of +1000 %, empty shops, workers not paid… just look at the eighties and they were a shocker … it may have been great for some because you had a job for life regardless of whether you were productive or not! Well that wasn’t going to last without foreign funds and debts and it didn’t.